Acute coronary syndromes (ACS) are the first cause of death worldwide and the leading cause of disease burden in high income countries1. Rapid and accurate diagnosis is critical because missing an ACS can be fatal and timely intervention improves outcome2,3. Acute coronary syndromes (ACS) is an umbrella term for conditions caused by sudden blockage of the blood supply to the heart. 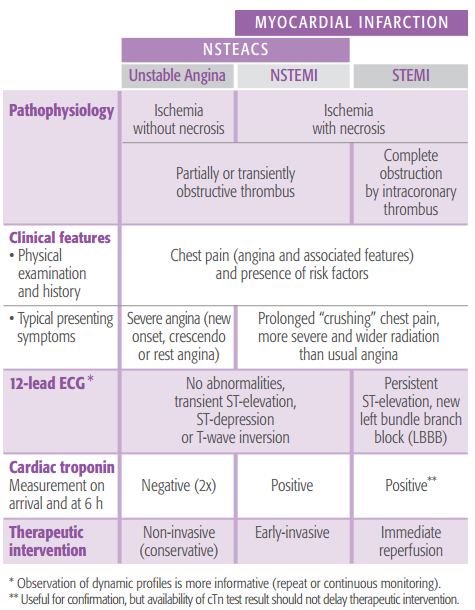 They range from a potentially reversible phase of unstable angina (UA) to irreversible cell death due to a myocardinal infarction (MI) - either a non-ST-segment elevation MI (NSTEMI) or a ST-segment elevation MI (STEMI) (see chart below). 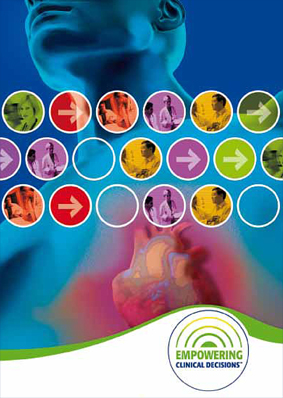 *Chart from bioMérieux clinical booklet, “Biomarkers in the management of cardiac emergencies”. Adapted from Bassand JP, Hamm CW, Ardissino D, et al. Guidelines for the diagnosis and treatment of non-ST-segment elevation acute coronary syndromes. Eur Heart J. 2007;28:1598-660. ACS is suspected when a person presents with symptoms, particularly chest pain, and especially when they also have known risk factors like high blood pressure, being overweight or a family history. Rapid and accurate diagnosis is critical because myocardial infarction (MI) requires immediate intervention and prognosis improves significantly with rapid treatment3. However, this is not always easy because symptoms vary greatly. 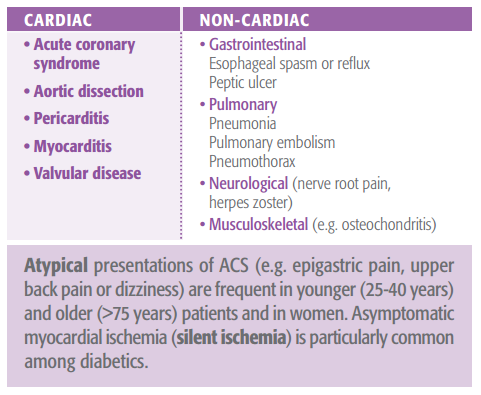 On top of that, there are many other causes of chest pain that are not ACS (see chart). In fact, as many as 8 out of 10 patients who come to emergency departments with ACS-like symptoms turn out not to have ACS2. By performing an electrocardiogram (ECG) and measuring for a biomarker of cardiac necrosis (cardiac troponin), clinicians can make a diagnosis of ACS, and furthermore distinguish the disease into three categories: unstable angina (UA), non-ST-segment elevation MI (NSTEMI), and ST-segment elevation MI (STEMI). A risk stratification score based on these tests is important to determine appropriate treatment. An electrocardiogram (ECG) can identify approximately 1/3 of ACS patients with persistent ST-segment elevation (STEMI). Cardiac troponin I and T (cTnI, cTnT) biomarkers help distinguish the 2/3 of ACS patients without ST-segment elevation (UA or NSTEMI). Cardiac troponin is the preferred cardiac necrosis biomarker, while CK-MB is an acceptable alternative when cTn is not available7. Serial measurement of cTn (on arrival and after 6 hours) is required in patients without ST-elevation on ECG7. Sensitive and specific cardiac marker tests with a rapid turnaround time are essential to global risk assessment and treatment of all patients presenting with ACS. 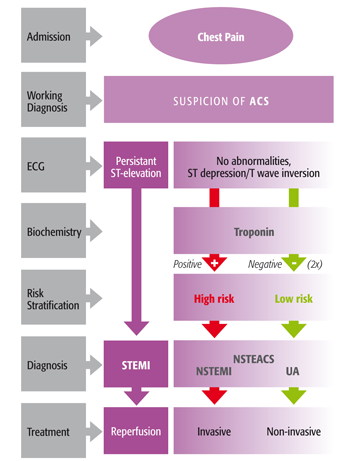 The distinction between ACS categories – STEMI, NSTEMI or UA –as well as an assessment of the likelihood of adverse outcomes is clinically important and drives the decision for timing, type and intensity of therapeutic intervention. To this end, a risk stratification score is determined integrating ECG, clinical findings and cardiac marker tests. A STEMI is a serious emergency and should be treated with immediate reperfusion – opening the blocked arteries to restore blood flow to the heart. The sooner this is done, the better the potential outcome. Once stabilized, treatment is aimed at preventing recurrence. UA and NSTEMI are emergencies and initial treatment is aimed at stabilizing cardiac ischemia – restoring blood flow to the heart. Generally, UA requires non-invasive treatment while an NSTEMI requires early-invasive treatment. Along with relieving pain, the goal is to limit or prevent progression.